If you get these for Christmas, you're unlikely to be disappointed by them. They sound good, and they look decent. But for £490+ we'd expect so much more, especially when you can buy the wonderful B&W P7 for £160 less. Better known for its exorbitantly priced Android smartphones, Vertu has launched itself into the lucrative headphone market. As you might expect, the first attempt we have here, the Vertu V Headphones HP-1V, are expensive. Starting at £490, they're tuned in collaboration with Bang & Olufsen and aimed very much at a high end audience. There's no Bluetooth or noise cancelling features here, these are passive hi-fi headphones that aim to deliver crystal clear audio, stylish looks and a comfortable fit. They're constructed with 'aircraft grade' aluminium, with both calf and lamb leather deployed on the headband and ear cups for added plushness. In your package you'll find a nicely designed box with all the contractual-obligation accessories – carry case, two cables – one with clicker, one without – airplane adapter and phono jack. Above all else with a Vertu product, you expect style and uncompromising design principles. But we found the Vertu HP-1V to be a bit lacking in this regard. They certainly don't have the appearance of a nigh-on £500 pair of headphones from a luxury brand like Vertu. That said, they're not exactly ugly either, and the materials used do all feel premium and robust. However, the construction could certainly be better. The hinges on the earcups come together like two jigsaw puzzle pieces that don't quite fit together, and the exposed audio cable above each one is also of concern – damage that small wire and your headphones are mullered. The clicker on the bundled cable – designed to help you control your music without touching your device – is one of the worst I've ever seen. Its plastic housing is really lightweight and flimsy. If it fell apart tomorrow I wouldn't be at all surprised. I don't find the HP-1V's terribly comfortable either. The padding in both the headband and the detachable earcups is minimal and not to my personal preference, but they're not unlike many other similarly priced products in this regard. They're nowhere near the comfort of an audiophile-grade pair of headphones like the Oppo PM-1 but nevertheless they're fairly similar in form factor to the B&W P series, particularly the P7. So hey, at least they're lightweight and don't get all hot and sticky. Yeah, the Vertu HP-1V sound decent. It's immediately apparent that an effort has been made to create a nicely balanced sound, and the involvement of Bang & Olufsen will have helped here I'm sure. The closed-back design offers decent isolation and the soundscape is nicely balanced, with punchy but not over-the-top bass, crisp high tones and a robust midrange. I like them. But I don't love them. Rather like the design, the sound quality is decent without ever threatening to blow anyone's mind. So I have to admit being a little disappointed. They are, after all, £160 more expensive than the truly lovely B&W P7, which has similar design downsides but utterly fantastic sound quality. 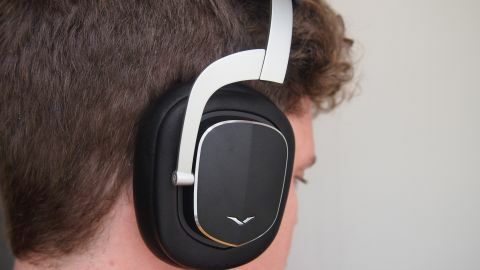 The Vertu HP-1V is a good pair of headphones. The sound quality is adequately elevated from the realms of a £200 price range but is it worthy of £490? I don't think so. Even Vertu fans might be disappointed with the design, and when you can pick up something like the P7's for a lot less cash, the case for choosing Vertu is really rather flaky at best.